Classic rock, country, and grunge artists were called out in our November issue. Submissions for the February-issue contest are due by Sunday, March 17. Reader Steven Davies reaped the rewards of his rock 'n' roll knowledge. Reader Steven Davies was the winner of our November DCV Rocks contest. Davies caught one of three song titles in that issue. "Coming together for road safety," our Q&A with Joshua Girard of AB InBev, was a reference to The Beatles' "Come Together." As Davies noted, the song was covered by Aerosmith, who had a Top 40 hit with it. And, of course, his prize was coffee from Aerosmith drummer Joey Kramer's roastery. "Come Together," a heavy blues song, was a number-one single for The Beatles in 1969. It's the very first song on the very last album they recorded, Abbey Road. (Let It Be was released later, in 1970, but recorded earlier.) As usual for the band, it was a John Lennon/Paul McCartney composition, but in this case Lennon was the main writer. According to the book Revolution in the Head: The Beatles' Records and the Sixties by Ian MacDonald, it started out as an attempt at writing a campaign song for Timothy Leary's short-lived gubernatorial campaign against Ronald Reagan. According to the book, the song "pitches a stream of self-confessed 'gobbledygook' at the violent antagonisms of an unenlightened world, implying that the language deployed in such confrontations is a trap and a potential prison." Finally, after 50 years, mystery solved. Other songs to be found in our November issue included "East Bound and Down" by country singer/songwriter/guitarist Jerry Reed and "Clean Machine" by The Presidents of the United States of America. Jerry Reed was born in Atlanta in 1937. Besides being a chart-topping performer in his own right, he wrote songs recorded by Johnny Cash, Brenda Lee, and others and recorded a Grammy-winning album with Chet Atkins. When Elvis Presley tried to record one of Reed's songs, "Guitar Man," his band couldn't get the guitar to sound right. Presley ended up hiring Reed himself to play on the record. Even today, people are eager to try to replicate Reed's picking style. Reed also had a career as an actor. He appeared in many movies with Burt Reynolds, who was a friend. Reed played Reynolds' sidekick Cledus in all three Smokey and the Bandit trucker movies. "East Bound and Down" comes from the first Smokey and the Bandit movie. It hit Number 2 on Billboard's Hot Country Songs chart. The item in our magazine is about the film. "Eastbound and down, redux," from our "Inbound" section, covers a re-creation by the industry organization Truckers.com of Smokey and the Bandit's Texas-to-Atlanta road race. The Truckers.com event included a free country-music concert where, presumably, "East Bound and Down" was performed. Jerry Reed died in 2008 from emphysema. He was 71 years old. "Clean machine" is the title of another "Inbound" item—this one about a Dutch nonprofit attempting to clean up the Great Pacific Garbage Patch. The song "Clean Machine" comes from the Presidents of the United States of America's 2004 album Love Everybody. The Presidents came to life in the midst of Seattle's 1990s grunge scene, but their music often leaned a little more pop than grunge. They're probably most famous for their hit single "Lump." Founders Chris Ballew and Dave Dederer played modified guitars, dubbed the basitar and guitbass, respectively. (The basitar is a standard guitar with only two strings, both in a heavy gauge normally used for a bass; the guitbass has only three strings.) The group's lineup was completed by drummer Jason Finn. Their first, eponymous, album reached Number 6 and eventually went platinum. The band broke up in 2015. There are three rock references in our February 2019 issue. 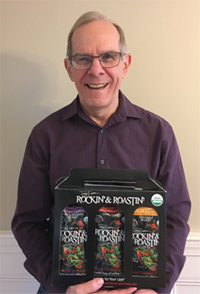 Correctly guess one, two, or all three and email the solution to dcvrocks@dcvelocity.com by midnight Pacific time on Sunday, March 17, and you'll be entered into our drawing for a three-pack sampler of Joey Kramer's Rockin' & Roastin' Organic Coffee. If you don't have a copy of the magazine handy, you can look through the headlines in our mobile version or online. Hints for February: The Beatles, Elton John, The Rolling Stones. Good luck! Please note: Previous contest winners may not enter for three months following their win. Presidents of the United States of America photo by Danny Lechanteur. Licensed under Creative Commons Attribution 3.0 Unported license. Feedback: What did you think of this article? We'd like to hear from you. DC VELOCITY is committed to accuracy and clarity in the delivery of important and useful logistics and supply chain news and information. If you find anything in DC VELOCITY you feel is inaccurate or warrants further explanation, please ?Subject=Feedback - : A mix of musical styles is reflected in our latest DCV Rocks solution">contact Chief Editor David Maloney. All comments are eligible for publication in the letters section of DC VELOCITY magazine. Please include you name and the name of the company or organization your work for.